Australia is made up of 6 states and 2 territories. Each of these areas offers a different Australian experience. From the big cities to the Outback or Great Barrier Reef there is much to explore. Enjoy memorable wildlife experiences or relax on an island resort. For the more adventurous travel let us take you off the beaten track to some of the more unusual places that Australia has to offer. When you are planning a vacation to Australia and the South Pacific, please remember that Australia is an island the size of the U.S.A. It is wider across than the distance from New York to Los Angeles but has a population of only 20 million people. Start your outback adventure in Alice Springs, in the heart of Australia’s Red Centre. Sail over the spinifex plains in a hot air balloon or bike ride to Simpsons Gap. Join a safari of quad bikes across the desert or fly over the MacDonnell Ranges. Peer into the traditions of the Aboriginal Arrernte people who have lived here for 20,000 years and browse contemporary Aboriginal art along Todd Mall. Connect to stories of Afghan cameleers, flying doctors and plucky pioneers in the many heritage sites around the town. This rollicking, modern town is also a day trip from the iconic attractions of Uluru-Kata Tjuta and Kings Canyon. Laze in the lush riverside gardens of South Bank, then browse the markets and swim in its lagoon. Bike ride in the City Botanic Gardens and abseil the cliffs of Kangaroo Point. Glide down the river on a majestic paddlesteamer or take a high-speed ferry to vibrant inner-city villages like Bulimba and New Farm. When culture cravings hit, wander the art galleries and museums, watch a performance by the Queensland Ballet, Opera or Orchestra perform or see cutting-edge theatre in the Powerhouse. In the boating hub of nearby Moreton Bay and Islands, you can swim, sea kayak, snorkel coral reefs, toboggan down the world’s tallest sand dune, hire a sail boat or tussle with a marlin. Dive the Brisbane and experience this historical treasure and budding environmental wonder. The ex-HMAS Brisbane Conservation Park is an artificial reef and dive site off the Sunshine Coast, and is set to become one of Australia’s premier dive attractions. The picturesque mountain retreat of Kuranda Village is just 25 kilometres northwest of Cairns in Far North Queensland, Australia. It is a vibrant little town surrounded by World Heritage Rainforest. Travelling to Kuranda is a highlight in itself. Visitors can travel to Kuranda on Kuranda’s Historic Scenic Railway, by car or bus, via the spectacular Kuranda Road, or above the rainforest canopy on Skyrail – the world’s longest rainforest Cableway. 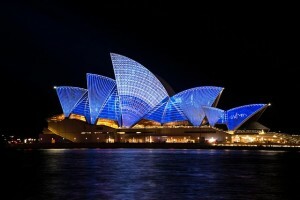 A valid visa is required for all people wishing to travel to Australia. Visitors of all nationalities (except Australian and New Zealand passport holders) must obtain a visa prior to arrival. Qantas Vacations can issue Electronic Visas, for a $25.00 fee per person, prior to your departure. The Australian unit of currency is the Australian dollar. All goods and services purchased in Australia are subject to a 10% Goods and Services Tax (GST), which is usually included in the displayed price. You may apply for a refund on the GST but only on goods costing A$300 (GST inclusive) or more, bought from the same store no more than 30 days before you leave Australia, which are to be taken with you as hand luggage or worn onto the aircraft upon your departure. Further information is available from Australian Customs upon arrival. The electricity current in Australia is 220-240 volts; AC 50Hz. The Australian 3-pin power outlet is different so you will need an adapter socket. Check your appliances to see if there is a 100-240v switch. If not, you will need a voltage converter. Universal outlets for 240v or 110v shavers are usually found in leading stores. When in Australia you can claim a refund on the tax you pay on some goods and services (except consumables). Refunds available at major airports in Australia. A bonafide tourist may drive in Australia on a valid overseas driver’s license. Please remember to drive on the left hand side of the road. Australian lifestyle is generally informal and the accepted norm is to dress for comfort. We recommend you pack lightweight, comfortable clothes and shoes, while a sun hat and sunscreen are essential. If you’re visiting during winter, leave space for a jacket or sweater and if you’re planning a special occasion a more formal outfit may be required. Wear a shady hat and cover up exposed skin with long sleeves or strong sunscreen. Wear factor 15+ and try to avoid exposure during the hottest part of the day – from 10am to 3pm. Truth be told, any time is a good time to be somewhere in Australia. When it’s cold down south, it’s magnificent in the north and the Center; when it’s too hot and sweaty up north, the southern states are at their natural finest. There are also the numerous festivals and other public spectacles that are on show every month, from the summertime food-and-wine banquets and large-scale concerts, through mid-year arts celebrations, to end-of-year footy finals, horse races and yachting contests. The seasons in Australia are the antithesis of those in Europe and North America. Summer is December to February; the weather and longer daylight hours are tailor-made for swimming and other outdoor activities across much of the country. Summer is also school holiday period and consequently high season for most places. Unless you want to compete with hordes of grimly determined local holiday-makers in ‘Are we there yet?’ mode for road space, places on tours, seats on transport, hotel rooms, camp sites, restaurant tables and the best vantage points at major attractions, you should try to avoid Australia’s prime destinations during the peak of school (January) and public holidays. During these times, you’re also likely to encounter spontaneous rises in the price of everything from accommodation to petrol. Winter is June to August, when temperatures drop with the latitude. This is officially designated the tourism low season for most of the country, but not the Northern Territory, Queensland and top of Western Australia. Winter in this northern stretch offers respite from the humidity of the wet season (which runs roughly from October to March, with the heaviest rain falling from January onwards; the Dry lasts from April to September) and the temperatures are highly agreeable. It’s also when roads and tracks are most accessible up north. Autumn (March to May) and spring (September to November) both enjoy a lack of climatic extremes everywhere.